The original thread is long buried under the weight of lots of great political news. Saturday was the start of caucus season, but it continues. 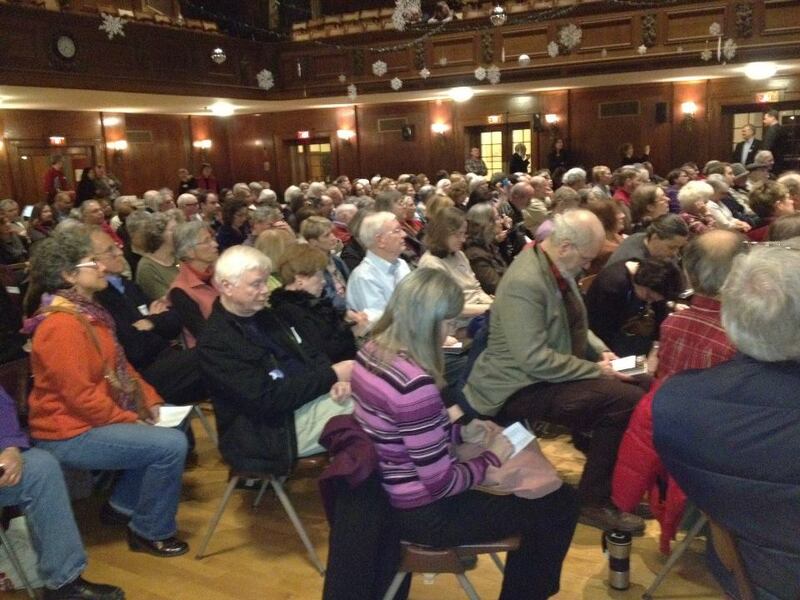 209 Democrats showed up at Arlington Town Hall to caucus, and sent a slate of 35 delegates committed to Elizabeth Warren to the convention in Springfield. Is that cell phone pictures have come a long way since the first one I took (of Stinking Bishop cheese in a shop – pardon the inside baseball). Sometimes even on the most partisan occasions, simple generosity and maybe a touch of the political junkie can transcend party lines. Our Arlington Democratic Town Committee chair, Aimee Coolidge, wrote to town committee members tonight to thank them for organizing the caucus (and recognized the hard work of the Warren organizers, too). But she also used her email to publicly thank a young Republican, Sean Harrington of Arlington, who came by Town Hall after almost all the Democrats were gone and helped Aimee put away the last of the chairs. “You just can’t make this stuff up,” Aimee wrote. Sean Harrington is the new chair of the Arlington Republican Town Committee. He told me that he wanted to see how we run a caucus. I suspect he wants to participate in the GOP congressional district caucus, and possibly get selected to go to Tampa. He sat in the balcony during the caucus, and then came downstairs and stacked a whole bunch of chairs. I;m knocking on some doors and then heading to Sudbury for their caucus. Candidates, including for State Committee such as yours truly, were given a chance to address the full assembly. Then we broke into wards. In my ward just enough people showed to fill the slate. Voting was easy; it was the paperwork that took longer. Marisa DeFranco was one of the candidates who spoke, but I don’t know if she got any delegates. Eileen Donoghue represented Elizabeth Warren. I saw a few new faces, who were solid Elizabeth Warren supporters and a new local volunteer with Organizing for America and Women for Obama. Several candidates were there to speak and get nominating signatures (Plymouth Registrar of Deeds Buckley, a representative of Plymouth Cty Commissioner candidate Greg Hanley, Rep. Garrett Bradley, and Congressman Lynch even showed up). Even more amazingly there were two State Senate candidates. Genevieve Davis spoke first and received polite applause. Certain parts of her speech gave me concerns as a loyal Democrat, for example, she mentioned that she helped her son run against a Democratic State Rep Rhonda Nyman. I’m not convinced she has the “fire in the belly” required to take on long-term incumbent Bob Hedlund, as she stated “My friends approached me about running for Norwell Planning Board, but I got to thinking, why not run for State Senate?” It’s going to take more passion and commitment than that to take on Sen. Hedlund. I delivered remarks from candidate Steve May* focusing on his background as a clinical social worker & advocate for people with chronic illnesses in state houses around the country. Unfortunately Mr. May was called away to make a presentation on genetic bias issues in New Jersey, but the response for his remarks seemed much more enthusiastic as people could sense that he has the fortitude to take on Sen. Hedlund. Delegate selection was rather routine, full slate of 7 delegates had just enough applicants (including my wife and I). There was definitely excitement in the room to re-elect our Democratic candidates including the President and to replace Scott Brown and Bob Hedlund. * Disclaimer: I am a volunteer for candidate Steve May, because I think he is the strongest candidate to take on our incumbent state senator in November. She helped her son run as an Unenrolled candidate, not in a Democratic primary. I recently heard Davis give a similar speech. As a mother, loving your son is precious. BUT I am not electing someone Mother of the Year. I am voting for someone to end Bob Hedlund’s Holy Reign of Terror. As a Democrat, her interest in running seems to be that she supported her son in challenging another Democrat. BTW that Democrat was Rhonda Nyhan who’d just lost her husband under tragic circumstances. Davis has worked at Fidelity for 28 years. She styles herself as a Elizabeth Warren type. Truth is she isn’t Warren. Anyone think Fidelity and State Street need more folks on Beacon Hill doing their bidding? By contrast, Steve May is a thoughtful committed progressive. I don’t completely agree with Steve on every issue, but it’s clear that he has an understanding of how the world works, and more importantly, he knows why he believes what he believes, and he can explain his world view. That’s refreshing!!! Steve has a depth of understanding around healthcare that is truly impressive, but he also has a handle on the many issues confronting the state. Most importantly in my gut, I believe Steve will fight for me, in a way Davis won’t. Steve has championed the needs of people on the margins of our society for years, and as best as I can tell he is good at it. Why wouldn’t folks on the South Shore want someone with his profile fighting for us on Beacon Hill. Business as usual with a printed slate of candidates, all the usual suspects. After rules were read the first order of business was for the chair to hear a move to not have any speeches, which was seconded and passed by voice vote with no discussion save my weak after the fact protest. Since I wanted to run, I had prepared a one-minute talk about me and my support for Elizabeth Warren and found it very frustrating that the caucus would be voting on delegates with nary a word about why they wanted to be a delegate nor who they would support. Still, a friend nominated me and after that two more non-slate women were nominated. This seemed to upset the apple cart a little and in the end all three of us were elected as alternates. Somehow, even if no rules were broken, it just didn’t feel like democracy .